. 天狗と伝説 Tengu legends "Long-nosed Goblin" - Introduction . Nichiraboo 愛宕山 日羅坊 Nichira-Bo, Nichirabo from Mount Atago.
. Zegai-bô 是害坊 Zegai-Bo, Zegaibo Tengu .
. Jirooboo, Jirōbō 次郎坊 / 二郎坊 Jirobo Tengu . 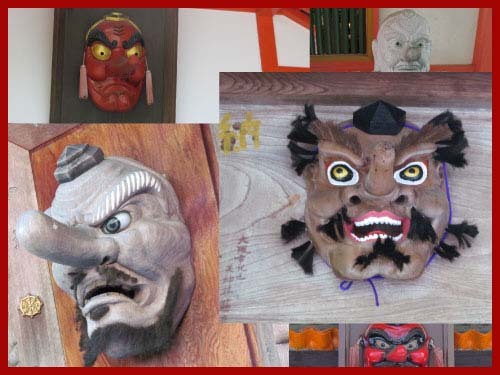 Tengu masks 天狗面 and bells 天狗鈴 are great amulets at the Shrine.. 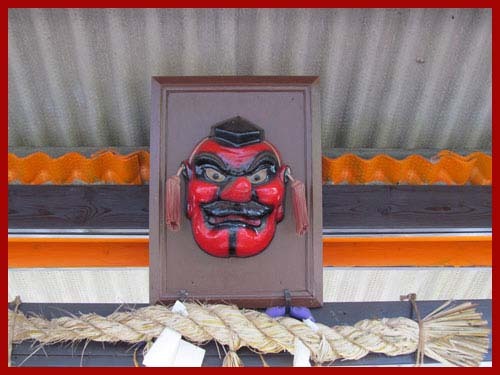 The Tarobo tengu is supposedly the elder brother of the Kurama tengu, under which the twelfth-century hero Yoshitsune trained. The young boy was an apprentice at the Tendai temple near Kyoto, and when he escaped to join his brother Yoritomo he made for the Akagami complex. The rock where he rested is now a shrine to his memory. ... The main kami is a son of Amaterasu. His name is not widely known,unsurprisingly since it’s Masaka-Akatsukachi-Hayahiameno-Oshi-Homimi-no-Mikoto. In Japanese mythology he was a heavenly warrior offered the chance by his mother to ‘descend to earth’ but he demurred in favour of his son Ninigi. According to the shrine, he has the attributes of the sun, rising every morning without fail to conquer darkness. As such he’s a kami of victory, whether it be in business, exams, martial arts or any other field of life. Prayers should be directed to that end. 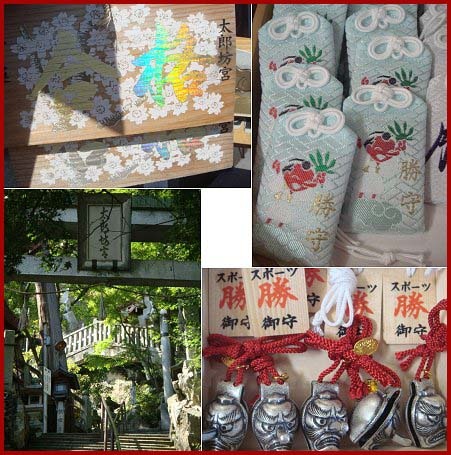 Click for more photos of Atagoyama Tarobo ! This priest studied Mikkyo Buddhism with Kobo Daishi. He often practised austerities at Takao 高雄の峯. Once he saw the honorable Lady 藤原明子 Fujiwara no Meishi (染殿后 Somedono no Kisaki) and felt love trouble in his heart. He died soon afterwards and became a blue demon. First he tormented Somedono and later he turned into an Ootengu 大天狗 Great Tengu. Tarobo from Atago was in fact a person called Shishido 宍戸三郎右衛門, who was a strong believer in the Atago deity. 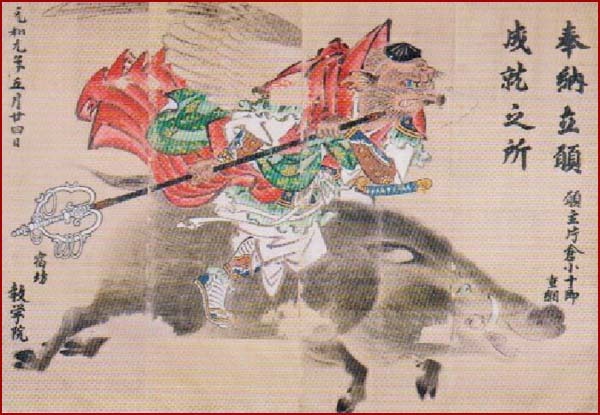 He is also responsible for the making the 猪 wild boar a messenger of the deity. Kani Saizo was a strong believer in the Atago Deity. 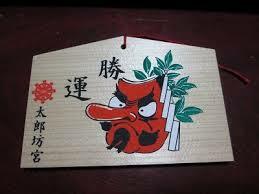 He even thought he was an incarnation of Tarobo the Tengu. But others thought he was just out of his mind. In former times it was known that people who believe strongly in the Atago Deity will die on the special day dedicated to Atago 縁日の日, the 24th of each month. Legend says Saizo felt his death coming, made his preparations on the day before and then died in the evening of the Atago Day. He died in the sixth lunar month on the 24th day 慶長18年6月24日 (1613).
. Mount Atago Yama 愛宕山 / 阿多古 Atagoyama . 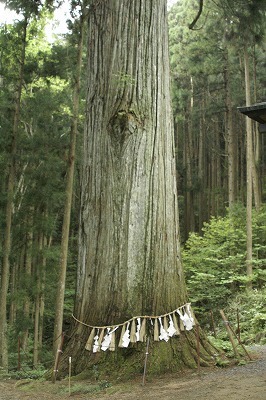 In front of the shrine there are two huge cedar trees facing each other. Their names are not related to the Tengu. Taro is the name of the elder son and Jiro the younger son. They are 太郎坊の杉 Tarobo-no-sugi and Jirobo-no-sugi 次郎坊の杉. Tarobo-sugi has a diameter of almost 7 meters.
. sugi 杉 cedar, cryptomeria .